Our Mirror Glass Splashbacks are made from Low Iron Glass Toughened Glass for a genuine certified toughened mirror. 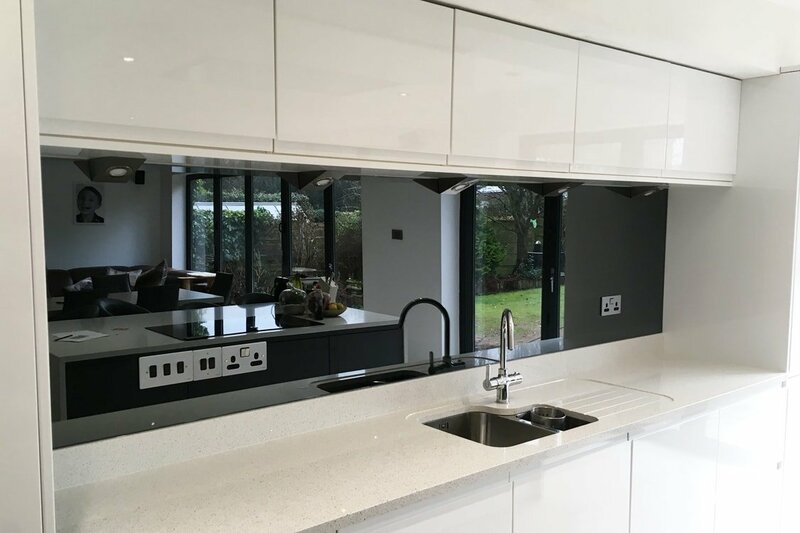 Add the ultimate in modern style with a Toughened Mirror Glass Splashback. Available in Grey they really do add a fantastic finishing touch to your kitchen. The great thing about our Mirror Splashbacks is that they are all properly toughened, all fully certified. Do not fall for some ‘toughened’ mirror which only have safety backing on. No matter which one of our splashbacks you choose, whether it’s coloured, printed or mirrored they are all made from Toughened Glass. Not only does this give you protection against knocks and bangs, you can even throw a pan at it and it won’t break, it is also heat resistant to over 400°C, so you can be safe in the knowledge that it will never crack from heat. (non-toughened glass will). Our Low Modular Specialist Adhesive has been designed specifically for our glass splashbacks. Unlike most adhesives it has been designed to not react with the paint of the splashback, ensuring you have a splashback that looks as stunning as the day you bought it in 10 years time. We recommend 1 Tube per SQ Meter. If you would like to attach your splashback using screws, our drills holes make it easy for you to do this. Set 50mm from each corner as standard, if you would like them in a different position please let us know, we recommend using screw head covers for the finished look. The charge for delivery is £19.99 to Mainland UK. Note: Some of our toughened mirror glass splashback may have a small black mark near the edge of the glass. This is to identify it as our glass and that it has been toughened.